The location of the very first UniCoaster is semi-secret. Please check back for details and announcements. 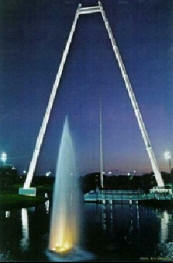 The Skycoaster® is one of the most thrilling amusement rides available in the market today. 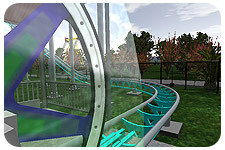 Its unique, patented concept combines elements from skydiving and hang-gliding. Passengers, appropriately termed “flyers”, can enjoy the tremendous, exhilarating sensations achieved from these two high-thrill sports without the high risk or cost. 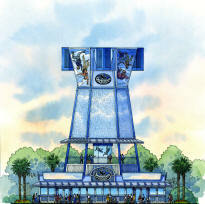 The Skycoaster® opens the skies to everyone, young or old, making man’s dream of “flight ” accessible to all. As you drive up, the strangely futuristic building rises in your windshield. You get out and walk towards it but then stop in your tracks, unable to make sense of what you see. A teenage kid in a colorful jumpsuit is floating directly in front of you. As you get closer, you see that he is more than floating, he is flying. He jets up and down, forwards and back effortlessly. You don't dare look away, even for a moment. He spins with mind blurring speed and stops dead in front of you. You notice him grinning ear to ear and you feel yourself smile. Right then you decide, "I gotta do this".